Latvian flag-carrier AirBaltic will be saved from collapse by the national government using taxpayer’s money the prime minister confirmed earlier. AirBaltic is already 52.6 per cent owned by the government, with Valdis Dombrovskis stating this stake would be expanded despite ongoing austerity measures in the country. The carrier recorded a loss of USD$67.2 million in 2010 and has continued to lose cash in 2011. “The main funds could be assigned through amendments in the 2011 budget,” Latvian prime minister Dombrovskis told journalists in Riga. However, assistance will be limited to 2011. Latvia agreed a USD$10.5 billion from the international community in 2008, stipulating any budget deficit must be below three per cent of GDP by 2012, seemingly ruling out further assistance to the carrier. This year the budget deficit was expected to be around 4.5 percent of gross domestic product (GDP), falling to below 3 percent next year. The other shareholder of AirBaltic is Baltic Aviation Systems, which owns 47.2 percent shares. 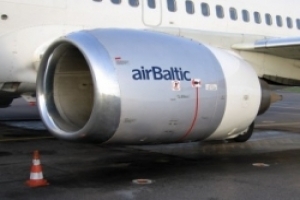 It is jointly owned by AirBaltic chief executive Bertolt Flick and the Bahamas Taurus Asset Management Fund.